Dr. DeRionne Pollard gives MC news and information from the Rockville campus Technical Center lobby, which is newly-renovated with the new College colors. Embed "Dr. DeRionne Pollard Video Blog #43" on your page. Embed "Dr. DeRionne Pollard Video Blog #42" on your page. Dr. Pollard addresses the College community from her office in the Mannakee administration building. Embed "Dr. DeRionne Pollard Video Blog #41" on your page. Dr. Pollard addresses the Montgomery College community from the groundbreaking for the new Holy Cross Hospital on the Germantown campus. Embed "Dr. DeRionne Pollard Video Blog #40" on your page. A video message from the president of Montgomery College to the college community with news and information concerning Montgomery College. Dr. Pollard delivers this message from GIS Day on the Rockville campus, along with Professor of the Year Dawn Avery and the NJCAA Women's Soccer National Championship Trophy. Embed "Dr. DeRionne Pollard Video Blog #39" on your page. Weekly video blog message from the President of Montgomery College to the college community with news and information concerning Montgomery College. Dr. Pollard delivers this message from the Fall Opening Meeting on the Rockville campus. Embed "Dr. DeRionne Pollard Video Blog #38" on your page. Embed "Dr Pollard's Video Blog #37" on your page. Weekly video blog message from the President of Montgomery College to the college community with news and information concerning Montgomery College. Dr. Pollard delivers this message from her office in the Mannakee administration building. Embed "Dr. DeRionne Pollard Video Blog #36" on your page. Embed "Dr. Pollard's V Blog #35" on your page. Embed "Dr. Pollard's Video Blog #34" on your page. Weekly video blog message from the President of Montgomery College to the college community with news and information concerning Montgomery College. Dr. Pollard delivers this message the Spring Closing Meeting on the Germantown campus. Embed "Dr. DeRionne Pollard Video Blog #33" on your page. Embed "Dr. Pollard's Video Blog #32" on your page. Embed "Dr. Pollard's Video Blog #31" on your page. Embed "Dr. Pollard's Video Blog #30" on your page. 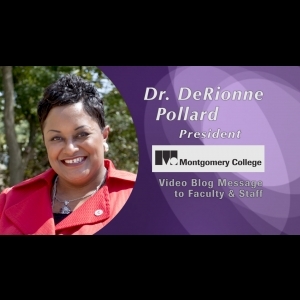 Weekly video blog message from the President of Montgomery College to the college community with news and information concerning Montgomery College. Dr. Pollard delivers this message from the President's office in the Mannakee administration building. Embed "Dr. DeRionne Pollard Video Blog #29" on your page. Weekly video blog message from the President of Montgomery College to the college community with news and information concerning Montgomery College. Dr. Pollard delivers this message from the Rockville Campus. Embed "Dr. DeRionne Pollard Video Blog #28" on your page. Weekly video blog messages from the President of Montgomery College to the college community with news and information concerning Montgomery College. Dr. Pollard delivers this message from the Globe Hall Atrium on the Germantown Campus. Embed "Dr. DeRionne Pollard Video Blog #27" on your page. Weekly video blog messages from the President of Montgomery College to the college community with news and information concerning Montgomery College. Dr. Pollard delivers this message from Student Svcs. building on the Takoma Park/Silver Spring campus. Embed "Dr. DeRionne Pollard Video Blog #26" on your page. Embed "Dr. Pollard's Video Blog #25" on your page. Embed "Dr. Pollard's Video Blog #24" on your page. Embed "Dr Pollard's Video Blog #23" on your page. Weekly video blog message from the President of Montgomery College to the college community with news and information concerning Montgomery College. Dr. Pollard delivers this message from the President's Executive Council meeting. Embed "Dr. Pollard's Video Blog #21" on your page. Embed "Dr. Pollard's Video Blog #20" on your page. Embed "Dr. Pollard's Video Blog #19" on your page. Weekly video blog message from the President of Montgomery College to the college community with news and information concerning Montgomery College. Dr. Pollard delivers this message from the Mannakee Administration building. Embed "Dr. DeRionne Pollard Video Blog #18" on your page. Weekly video blog message from the President of Montgomery College to the college community with news and information concerning Montgomery College. Dr. Pollard delivers this message from the School of Art + Design at Montgomery College. Embed "Dr. DeRionne Pollard Video Blog #17" on your page. Embed "Dr Pollard's Video Blog #16" on your page. Embed "Dr. Pollard's Video Blog #15" on your page. Weekly video blog messages from the President of Montgomery College to the college community with news and information concerning Montgomery College. Dr. Pollard delivers this message from The Commons building on the Takoma Park/Silver Spring campus. Embed "Dr. DeRionne Pollard Video Blog #14" on your page. Weekly video blog messages from the President of Montgomery College to the college community with news and information concerning Montgomery College. Dr. Pollard delivers this message from the Office of Student Life on the Germantown campus. Embed "Dr. DeRionne Pollard Video Blog #13" on your page. Weekly video blog messages from the President of Montgomery College to the college community with news and information concerning Montgomery College. Dr. Pollard delivers this message from the Theater Arts Arena on the Rockville campus. Embed "Dr. DeRionne Pollard Video Blog #12" on your page. Embed "Dr. Pollard's Video Blog #11" on your page. Embed "Dr. Pollard's Video Blog #10" on your page. Weekly video blog messages from the President of Montgomery College to the college community with news and information concerning Montgomery College. Embed "Dr. DeRionne Pollard Video Blog #9" on your page. Embed "Dr. Pollard's Video Blog #8" on your page. Embed "Dr. DeRionne Pollard's Weekly Podcast #6" on your page. Embed "Dr. Pollard's Video Blog #7" on your page. Embed "Dr. DeRionne Pollard Video Blog #5" on your page. Embed "Dr. DeRionne Pollard Video Blog #4" on your page. Embed "Dr. DeRionne Pollard Video Blog #3" on your page. Embed "Dr. DeRionne Pollard Video Blog #2" on your page. Embed "Dr. DeRionne Pollard Video Blog #1" on your page.